James Atack began his baseball and hockey careers in Niagara Falls’ minor leagues. In baseball, he played short stop on the three Ontario Baseball Association (O.B.A.) teams that won championships: <a href="default.asp?pg=detail&rec=1017">1955 Niagara Falls Citizens</a>, Juvenile O.B.A. Champions, <a href="default.asp?pg=detail&rec=1030">1957 Kerrio Construction</a>, Senior O.B.A. Champions, and <a href="default.asp?pg=detail&rec=1002">1958 Niagara Falls Lorenzos</a>, Junior O.B.A. Champions. Upon graduation from university, Jim played with the London Majors of the Intercounty League and in later years enjoyed participating in the Greater Niagara Softball Association (G.N.S.A.) and with McRae’s in O.S.A. competition. In 1956 he was a member of the Kerrio Junior C finalist hockey team and in 1957 was a member of the Senior B Stamford Kerrios hockey team. Michigan State University awarded Jim an athletic scholarship for hockey in 1958. That year the team was a National Collegiate Athletic Association (N.C.A.A.) finalist and the number two ranked team in the U.S.A. Three varsity letters were awarded to him prior to graduation in 1961. 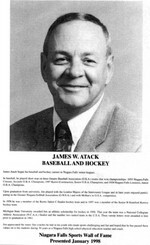 Jim appreciated the many fine coaches he had in his youth who made sports challenging and fun and hoped that he has passed these values on to his students during 30 years as a Niagara Falls high school physical education teacher and coach.